The Tower Pod Station offers the ultimate experience in self-serve beverages for the customer and high profits for the owner operator. It features a large 15″ media screen to display advertisements and promotions. 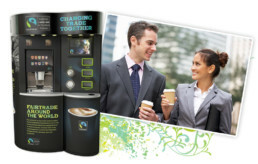 Ideal for medium to large footfall locations the Tower Pod is a station that displays papers cups and lids and a bean to cup coffee machine serving a range of delicious continental style hot beverages together with compartments for sugar, stirrers and napkins. Ideal for certain self-serve or partially supervised locations. Choice of coffee machines to suit location and budget. Machine shown in image is the Vitro.